There is a culture of thriftiness on the allotment site. From used water pipes, old yoghurt pots and Ikea shelving, the place is littered with useful items reclaimed from a former life to help with the growing of vegetables. 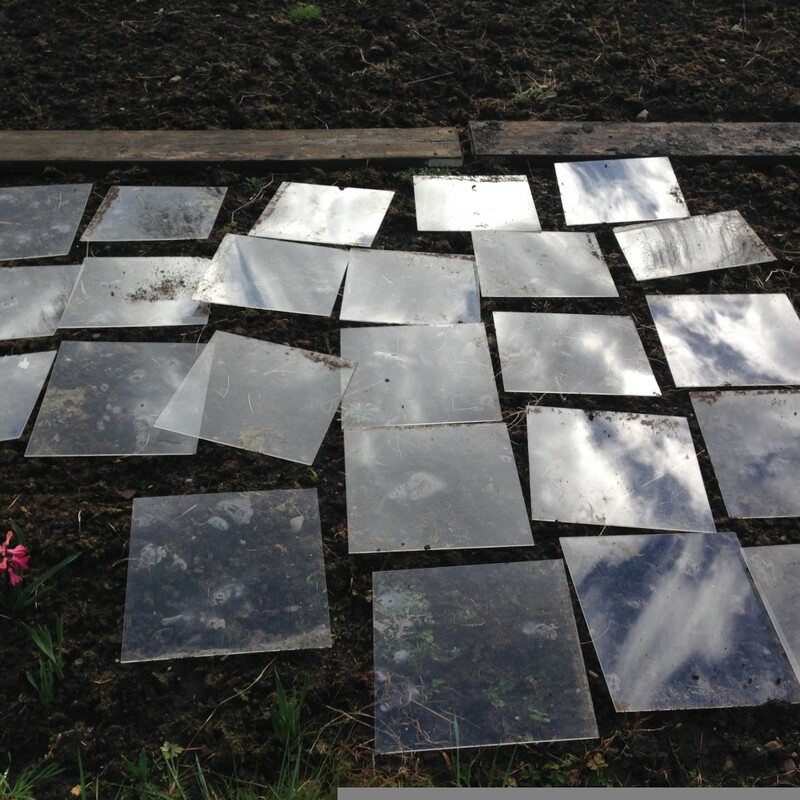 Our contribution to mend-and-make-do are these squares of perspex, saved by Matt from a long-forgotten art project, which I’ve put down to warm up a small patch of soil ahead of some direct sowing next week. I have no idea if it will work, but it’s worth a try (and lots cheaper than expensive plastic matting). 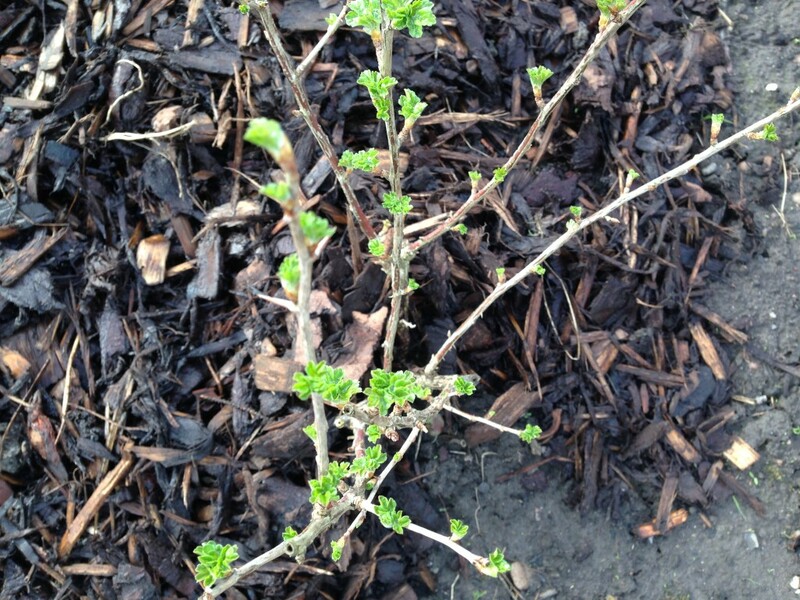 The gooseberry has survived its move the other week and is now the first of all the fruit bushes to break leaf. This week marks the tenth anniversary of going it alone as a freelancer! Not that I set out to run a business – I actually just left a job that wasn’t going so well, took on a few freelance projects and now it’s ten years on and I’m still here. The first three years were HARD but perseverance paid off and I consider myself blessed: I’ve worked with some great people on some great projects and made some great friends in the process. I’ve got a new website to mark the occasion (www.helenstallard.co.uk). But an anniversary doesn’t need a website, of course, it needs a feast. So I asked three work chums to dinner and planned an elaborate menu including a lamb tagine with which to show off. I even went to Whole Foods to get the particular spice mix I wanted, a pretty ras-el-hanout, which they grind fresh and has actual rose petals in it. 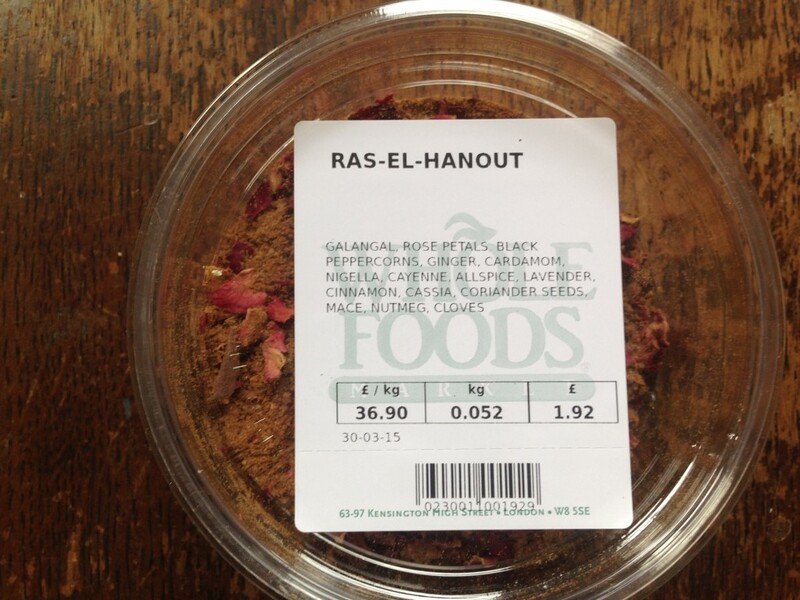 Tip: When making tagine, go easy on the ral-el-hanout. It’s all pretty and demure, with its pink petals, but a little goes a very, very long way. I got carried away, chucked in a load, then spent Tuesday evening trying to rescue said tagine with tins of tomatoes and passata. In end it tasted fine but by that point I was SO OVER tagine and it’s gone in the freezer to be eaten another day. We had roast chicken instead. Another tip: Don’t bother planning elaborate dishes for your guests. All they want is gin and a good pud. So the hero of the hour was a hazelnut and chocolate dacquoise, which was met by Helen, Simi and Claire with appreciative grunts. Hazelnut and chocolate dacquoise – the hero. I meant to take more photos but clean forgot after a glass of celebratory fizz. It’s very simple to make: whip up a vat of meringue, stir in some finely chopped hazelnuts, dollop into three disks and then bake for a couple of hours. Meanwhile make a chocolate cream from good quality dark chocolate, creme fraiche and whipped cream, then stick the lot together and leave for an hour or two for the meringue to soften. Last tip: If making this, use fresh cream if you can. Mine was a few days old and didn’t really appreciate the double-whammy of being whipped and then folded into the chocolate, so the chocolate cream ended up not quite as smooth as it should be. It still tasted fine. This is a really, really good dessert to have up your sleeve. It’s indulgent and feels special, but is light enough to not kill everyone after a full meal. Serve it up with pouring cream and raspberries. 1. Toast hazelnuts in a dry frying pan until golden – be careful not to burn them. Chop very finely and set aside. 2. Draw a 20cm circle on three pieces of non-stick baking parchment, flip them over (so you don’t get pencil on your meringue), then place on three baking trays. Preheat oven to 110c and make sure you have three shelves in with enough room between them to accommodate the meringues. 3. Make meringue: In a large, clean bowl, whip the egg whites until they hold their shape but aren’t dry. Add the sugar a little at a time, making sure each addition is properly mixed in before adding the next. Finally, fold in all but 1 tablespoon of the hazelnuts. 4. Divide the meringue between the three baking trays, spreading them out to fit your circle. Try and make them as flat as you can, to make stacking easier later. Sprinkle the reserved nuts on one disc. Bake for two hours or maybe longer – they are done when they can be removed from the paper easily. Leave to cool in the switched-off oven. 5. Two hours before eating (no more, else your meringue may go too soggy), finish the dacquoise. Melt the chocolate in a bowl over simmering water, then stir in the creme fraiche. Remove from the heat. Whip the cream until it just holds its shape, then fold into the chocolate cream. You should get a loose, glossy mixture that just about holds its shape. 6. Put one meringue disc onto a flat serving plate, spread over half of the chocolate mixture, repeat with the second disc, then finish with the disc covered in hazelnuts. Chill for two hours before serving. 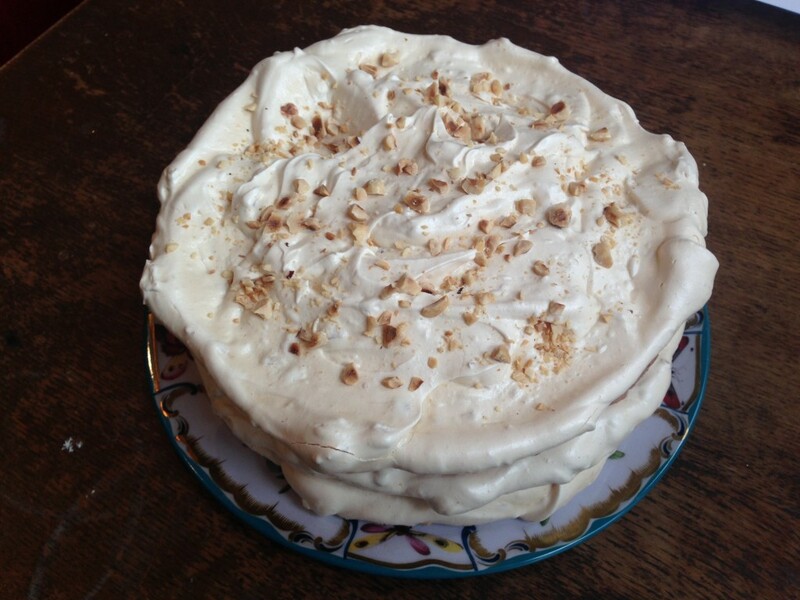 This entry was posted in Recipes, Sweet and tagged dacquois, french odyssey, Meringue, ras el hanout, rick stein, Rick stein hazelnut gateaux. Bookmark the permalink.